I am not a mustard person, which is why I had pinned this recipe quite some time ago but have been finding reasons to put off trying it. But I had company coming over and needed a quick, easy dinner I could throw together. I was really worried that the three main ingredients—dijon mustard, maple syrup, and a sweeter vinegar—would just make this way too intense, all the flavors fighting each other. But I was pleasantly surprised by how the flavors actually kind of balanced each other out, making the end result sweet, tangy, and with just enough bite to keep your interested. The other nice flavor component was the rosemary. 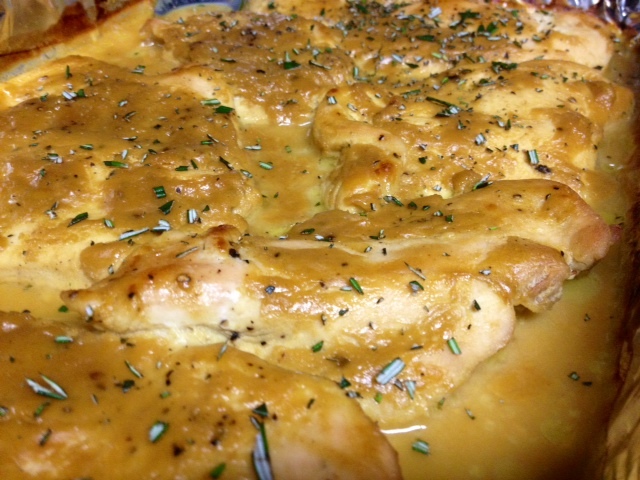 If you don’t have it the recipe is still great, but the fresh rosemary just adds another great layer of flavor with the mustard-maple sauce. 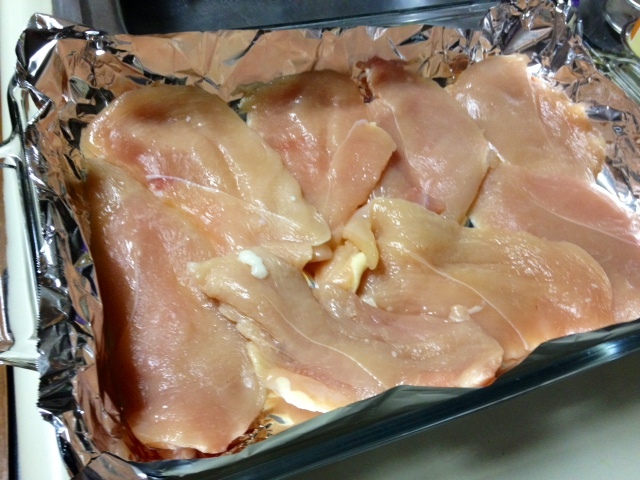 Place your chicken breasts in a foil-lined pan (trust me on this one, it makes cleaning up SO much easier!). 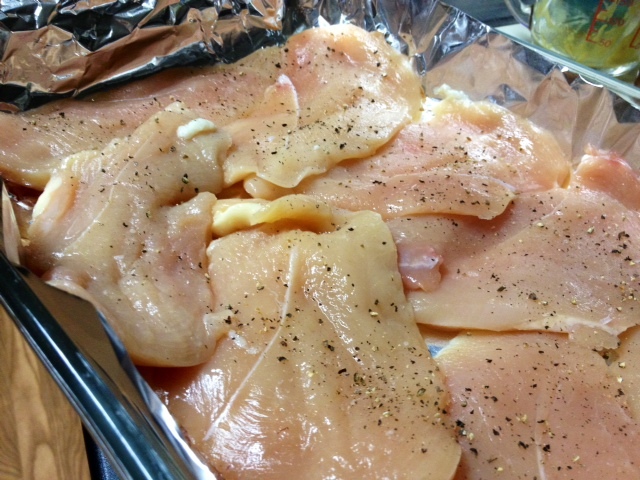 I cut all my chicken breasts in half (butterflied/filleted them) so they’d cook faster and more evenly. Next we whip up the sauce/marinade. It takes only three very intense ingredients, and then you just adjust to your own personal tastes. Note, the actual recipe calls for rice or rice wine vinegar, which I didn’t have. 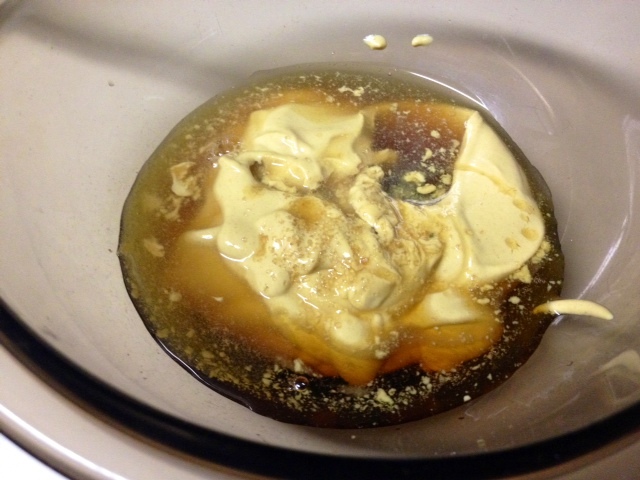 After some googling, I used apple cider vinegar and added a tiny pinch of raw sugar. It was delicious. Play around with the proportions based on the tastes you like (a tiny bit sweeter for me, a little more mustard-y for other people). Whisk everything together. Season the chicken with some fresh-ground salt and pepper. 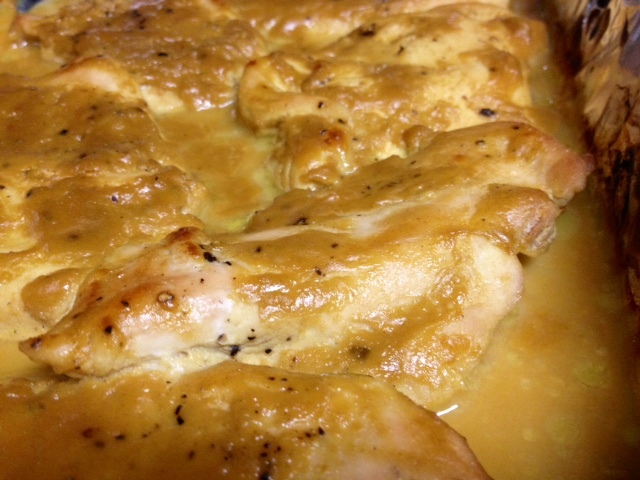 Then pour all the sauce over chicken, lifting the breasts to let the mustard run underneath them as well. 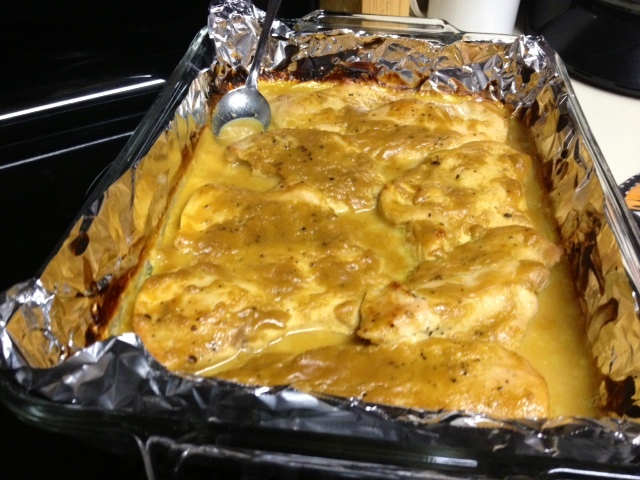 Bake for 20-40 minutes (was closer to 20 for me because I’d filleted the breasts), until the chicken is cooked and the sauce has formed a kind of glaze on top. About halfway through I spooned some more sauce on top of them so they’d stay moist. At the end, I broiled it for 1-2 minutes to make the sauce on top kind of golden and glaze-y. 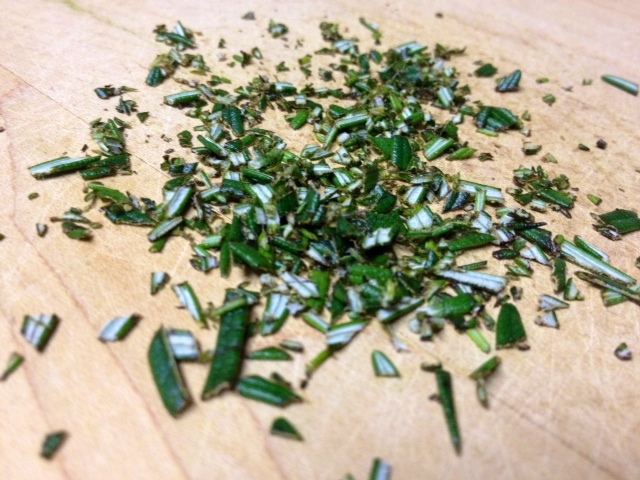 If you have fresh rosemary, chop it up fine and sprinkle on top. This recipe was so easy and JAM PACKED full of flavor. It made my house smell amazing, and was absolutely delicious. I’ll definitely be revisiting it down the road. Preheat your oven to 450ºF. 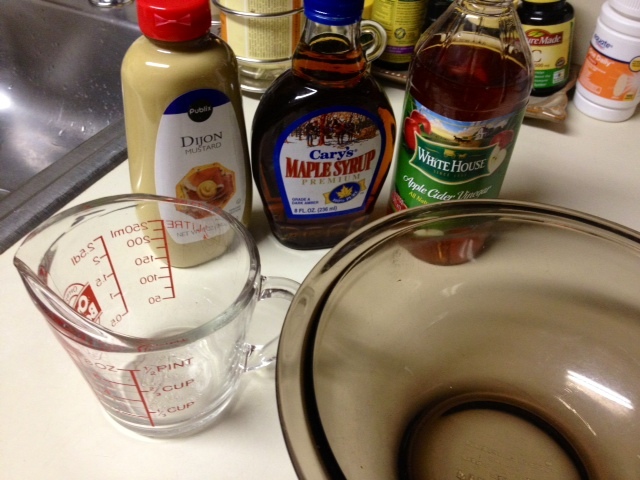 Whisk together the dijon mustard, maple syrup, and vinegar. 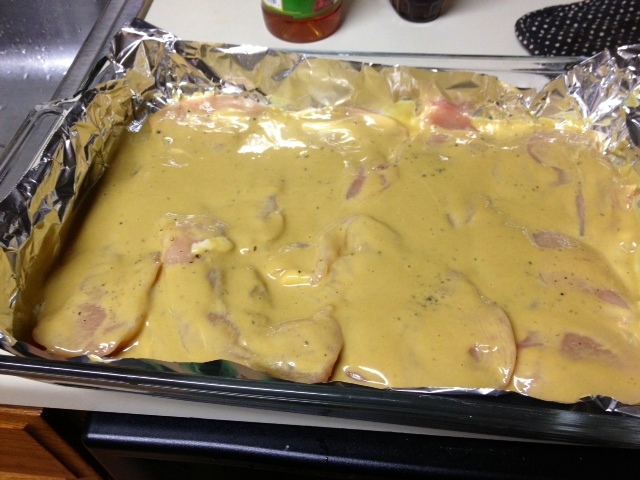 Place the chicken breasts or thighs in a foil-lined baking dish. 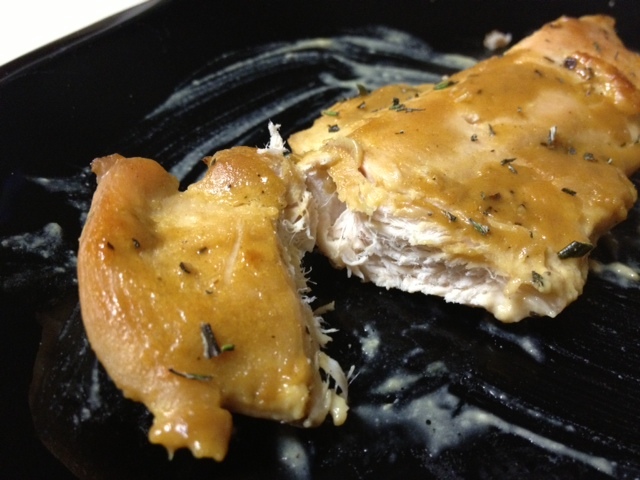 I sliced all of my chicken breasts in half to make them thinner (filleting, not making them chicken tenders). Then, sprinkle the chicken with salt and pepper. 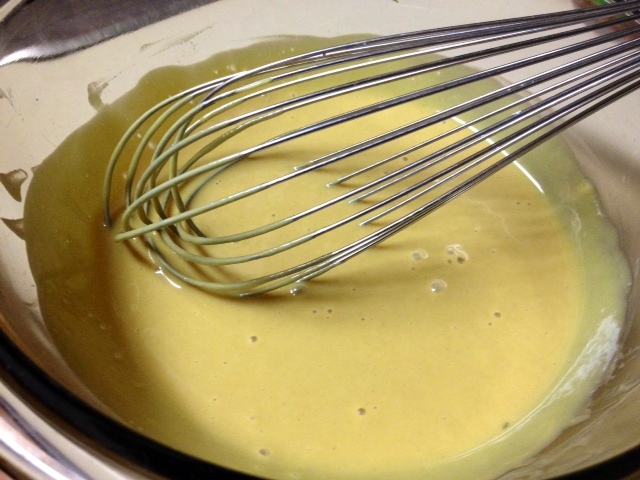 Pour the maple-mustard sauce over them, turning them in the sauce so they are fully coated. Bake for 20-40 minutes (closer to 20 if you’ve sliced the breasts thin like I did) or until a meat thermometer reads 165ºF. About halfway through, spoon more of the sauce on top of the meat to keep it moist. I broiled it for 1-2 minutes at the end to get a nice golden done-ness on the sauce. Once out of the oven, let the chicken rest for 5 minutes before serving. Sprinkle some fresh rosemary on top for garnish. These instructions were a little clearer than the original recipe poster’s. I ended up cooking thighs for 30 minutes (plus 2 minute broiling time) and basted them halfway through as you suggested and they turned out great! Also, great tip about foil-lining the pan — I saw one blog post where a lady basically ruined her pan making this recipe! I’m so glad it worked for you! Tin foil is my best friend, my mom gives me a hard time about lining every single pan with it, but it makes cleaning up SO much easier!